Company Statement | Enpower Corp.
Enpower Corp.’s history begins in 1993, with the formation of UAE Energy Operations Corp. (UAE Energy). Enpower Corp. was formed in late 2002 with the management buy-out of the western business unit of United American Energy Corp. (a leader in waste-to-energy and project recovery services), which included UAE Energy. Edward W. Tomeo, Vice President for United American Energy and President of UAE Energy, led this western unit buy-out. The acquisition of UAE Energy, and the continuity in management team, business and facility ownership, provide Enpower Corp. with a substantial record of performance since 1993. UAE Energy Operations Corp., now Enpower Management Corp. (Enpower Management), was initially formed in 1993 to provide business and operations management services for two recently acquired electric generating facilities. Both were substantially impaired businesses purchased out of the bankruptcy of an independent power producer, Oxford Energy Corp. The first was Modesto Energy Limited Partnership, a 14 MW waste-tire-to-energy facility located in Westley, CA. The second was Wadham Energy Limited Partnership, a 26 MW rice hull-to-energy facility located in Williams, CA. Both of the projects were rescued from near immediate failure, and brought back to long term economic health. Enpower Management delivered tremendous new value to both projects. Safety and environmental compliance programs were implemented. The operations personnel were trained and provided effective operating tools and systems. Fuel supply and power sales contracts were restructured. Byproducts were converted from disposal expenses to recycle sales. Operations and maintenance costs were slashed. Tens of millions of dollars of new value were delivered to the distressed lenders holding positions in these projects. 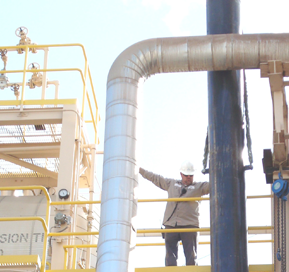 In 1996, Enpower Management took on business and operations management services for Oildale Energy LLC, a recently acquired 40 MW gas turbine cogeneration facility in Bakersfield, CA. Enpower Management embarked on major value-adding programs here as well. Through operations and maintenance improvements, reliability of electric generation to Pacific Gas and Electric and thermal supply to an adjoining refinery were greatly improved. In 1999, to deal with generating equipment performance risks and improve economic performance, Enpower Management initiated a first of its kind retrofit of Oildale’s GE LM 5000 gas turbine with an LM 6000. This resulted in substantially improved fuel efficiency, higher reliability operation and elimination of risk of failure of the unique power turbine that was coupled to the GE LM 5000. In 2000, Enpower Management took on an assignment to provide operations support to Duke Energy North America at its Oakland, CA generation facility. Enpower Management continued to provide those services to successor owner, Dynegy Oakland LLC, until 2008. In 2006, the gas plant owner at Cherry Island was in contractual dispute with the Delaware Solid Waste Authority (DSWA) and was not delivering on technical performance obligations, which began triggering regulatory problems. Enpower Operations Corp. (Enpower Operations) stepped in at that time, negotiated a settlement of the disputes, acquired the gas collection and sales business and then immediately transferred it to the DSWA. Enpower Operations and DSWA signed an asset management agreement and an operations contract. Enpower Operations then embarked on major day-to-day operational improvements, extensive training for the workforce, and implementation of a multi-million dollar capital upgrade program to alleviate production bottlenecks, which were a major source of the regulatory problems. Enpower Operations provided full operations and business management services, including well field collection system management for the DSWA through June, 2009. In 2008, EIF, through its US Power Fund III, and Enpower completed the acquisition of the Kansas City LFG facility. The KCLFG facility, owned by EIF KC Landfill Gas, LLC (KCLFG), is a Selexol process plant operating on the country’s largest privately owned landfill. This facility is one of a small but growing number of high Btu facilities in the United States and is an industry leader in terms of operating capacity. In late 2008, KCLFG was rolled up under the EIFREH ownership. Enpower Operations provided full operations and business management services, including well field collection system management for EIF through April 2012. In 2010, Timberline Energy, LLC, which holds a portfolio of operating and developing landfill gas projects, was acquired by LES. LES is wholly owned by EIFREH. Enpower Operations Corp provided operations and asset management services to Timberline Energy, LLC’s Butler and Oklahoma City facilities through April 2012. Over their history, Enpower Management and Enpower Operations have developed and utilized specialized skills in their business management services including contract restructuring, regulatory compliance improvement strategies, developing new products, managing major capital improvements and managing bankruptcies for business opportunity. The management team has utilized win-win strategies in restructuring numerous contracts for product sales, fuel supply and services. They have performed extensive environmental remediation and re-permitting activities, including the development of a monofill and a licensed hazardous waste transfer facility. Enpower Management has developed markets, and new operations to serve them, in multiple ash products to the steel industry, concrete industry, chemical processing and agriculture. Enpower Management has also managed large capital projects to expand existing facilities and retrofit improved technology. Such projects have included a gas turbine replacement upgrade, ash handling system additions, ash bagging facilities, materials handling improvements, as well as, numerous controls systems upgrades. Enpower Management is skilled in bankruptcy proceedings. It has participated in a number of bankruptcy processes, including making two acquisitions. It is intimately familiar with the benefits and detriments of bankruptcy, and knows how to manage them to significant business advantage. Enpower Management and Enpower Operations seek to provide new business and operations management services to owners, developers and lenders in energy and process industries. Enpower Management has also expanded its business management services to provide acquisition due diligence, project feasibility, and project and process development. Enpower Corp. seeks new acquisition and business development opportunities in energy and process industries.